The rundown: I’m not so confident in my predictions here because of my lack of expertise in this particular category, especially as it differs from Best Sound, but I’m betting on this field matching up four out of five with that race as it has the past two years. 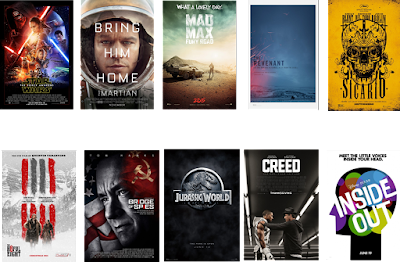 The four frontrunners are Star Wars: The Force Awakens, The Martian, Mad Max: Fury Road, and The Revenant. Joining them I think will be Sicario, but it could just as easily be The Hateful Eight, Bridge of Spies, Jurassic World, or any number of other films. One possible crazy scenario: The Walk is honored for heightening the suspense of its spectacular extended sequence. Forecasted winner: I think that Star Wars: The Force Awakens sweeps most of the technical categories.